Another Dodge County Fair has come and gone. I must confess, I wasn’t much of a county fair person until I married my wife. She grew up very active in 4-H and participated in both exhibit and animal judging. When we moved (back) to Wisconsin in 2001, our oldest son was four and discussions were already beginning regarding starting up in 4-H. Since our children have gotten involved in 4-H, I see what I missed as a child. For me, it’s pretty amazing to walk through the youth building up at the Dodge County Fair and see the hard work and excellence these young people have put into their projects. I enjoy watching it happen year after year. Inevitably, though, someone will make a comment about some project or another to the effect that “a child couldn’t possibly have done that.” (Implication: the child’s parent must have done it for them). While I recognize that the possibility is always there, I would submit that if the judge does their job, he or she can sniff it out if the child is not giving very good answers to the questions being asked by the judge. In Dodge County, I would also submit that the youth/parents police the process to such an extent that such a forgery would be a very unlikely prospect indeed. That doesn’t mean that the allegation will not still be made, never mind the great unlikelihood of it being true. This year, I heard it about the wedding cake that won the “Wilton’s Best” award. The Wilton company, maker of all good things in cakery, sponsors a special award every year. The girl who made this year’s winning cake has a long track record of great cakes now at the fair. It wasn’t a surprise to me to see her win it and I was happy for her. Moreover, I know her family and the suggestion that the cake was designed and made by anyone other than that girl is preposterous. Still, the allegation was made, quietly, but I noticed it…and I take exception to it. You see, six years ago it was my daughter. She was a Cloverbud at the time, second year. She submitted a sewn article that was very well done. Jennifer had been teaching her the skills from a very young age, but Jennifer does no one’s projects for them. Despite getting good answers to her questions, it was the judge herself who told another judge that there was no way an 8 year old had sewn such a good article. (Thankfully, the other judge knew us and defended us, as did the county extension agent). Still, Rebekah got a Red (2nd place) for an article that could have gotten a Purple (Special Merit). (One month later, Rebekah won a national sewing contest in her age group hosted by Nancy’s Notions). At least, Rebekah was able to dust herself off and be successful again. Since then, she has had three articles go to the State Fair and pulled two special merits there as well. The problem behind the problem, though, is what compels this article. The real problem with this accusation, especially when it is patently false, is the cynical attitude toward children that underlies it. And this cynical attitude toward children is the number one reason people are having fewer of them. Children are often defined by their limitations in our modern context. They are limited in their gifts and they are often viewed as financial liabilities as well. It’s really not a safe world for children these days. At the County Fair every year, I see a culture of people who are loving and encouraging toward children and do their utmost to help them succeed. Unfortunately, the people I hang with for five days every year are an overwhelming minority. Too many people today have no time for children. The better standard is the one that sees children as having unlimited potential. They are, in essence, blank slates waiting for some adult who loves them enough to help them succeed to teach them how to do so. If we, who love our children, don’t get to them first, imagine who will eventually get to them. The time spent teaching our children how to sew or do any number of other activities is the time spent giving them something they will have for life. My prayer is that my children will look back on all they learned from their mother (and I, but especially her) and see how much she (we) loved them. The Bible is not cynical at all about children. 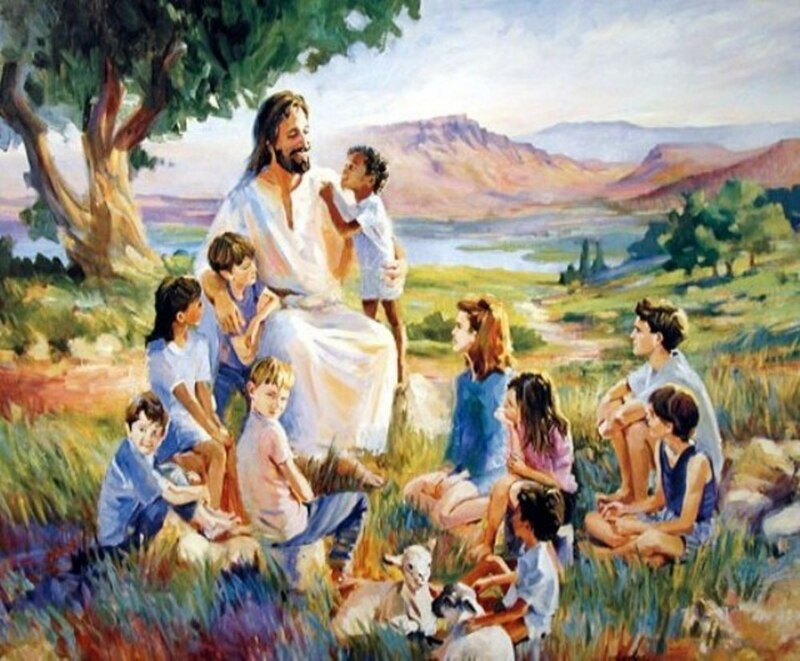 Children are a “treasure,” an “heritage.” Jesus bids the babies to come to Him. He sought them out to bless them. Jesus, in His incarnation, establishes our humanity as holy because He Himself is holy. This includes our childhood. Whenever we have a family that is expecting a baby here at St. John’s, I try to make a point of getting to them before the birth to talk about Baptism, but there is a part of the discussion also dedicated to Christian parenting. All parenting that is Christian begins from the same premise: our children are a blessing of God to us. They are not a right for us to have. They are a privilege from the Creator to be loved and nurtured like all God’s blessings. They are not liabilities or limitations. They are the future. Some day, I will be unleashing my children on the world. My prayer is that the world would be as blessed by their efforts as we were in receiving them from our good and gracious God. Just the thought of unleashing them on the world makes my work on their behalf today that much more special. I love nothing more than seeing my children succeed. It isn’t about me. It’s about them. And my only prayer is that these skills and talents they are developing and employing with success would be a blessing to others. To define a child in terms of what you think they are not able to do is to limit society itself.